Let $n$ given points have the property that the line joining any two of them passes through a third point of the set. Must the $n$ points all lie on one line? T. Gallai's proof has been outlined by P. Erdös in his submission of the problem to The American Mathematical Monthly in 1943. 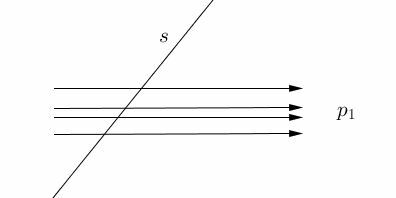 Given the set $\Pi$ of noncollinear points, consider the set of lines $\Sigma$ that pass through at least two points of $\Pi.$ Such lines are said to be connecting. Among the connecting lines, those that pass through exactly two points of $\Pi$ are called ordinary.